Just when you thought a bow was just a bow... We give you all these choices to create a piece to suit your style. Not too sure what size to get? What's the difference between a snappy and a clippy, partially or fully lined? Here, let us clue you in. What are my clip choices? The Snap Clip (Snappy) is perfect for babyfine and infant wisps of hair. They are best at gripping just a few strands of hair. All snappies come complete with our unique hair grippers. Our grippers keep your clip in place without pulling. 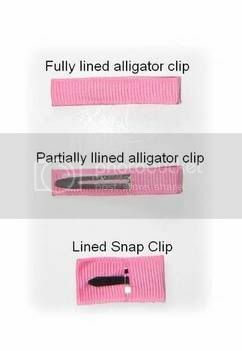 The Alligator Clip (Clippy) is great for older babies and toddlers (about 1 yr+). This clip is super easy to clip into hair. 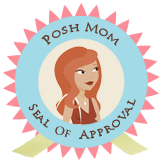 Its a great choice for clipping some hair to the side or decorating ponytails and pig tails! 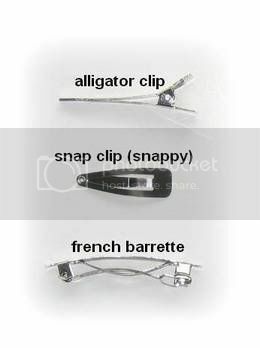 The French Barrette is a great clip for older toddlers with more hair and little girls. These clips are also perfect for adorning ponytails. The French Barette can be used on almost any of our clip styles. Just ask! It may not be listed as an option, but it's usually available in a 2" length. What's the difference between partially and fully lined clips? Our clips come partially or fully lined. We find fully lined clips work best on younger babies or those with delicate heads. Some people prefer not to see the actual clip. Partially lined clips are easier to use in thicker hair or for adorning ponytails and pig tails. Partially lined clips are the default choice we use to line most clips, unless otherwise noted. All snappies and clippies come complete with our unique hair gripper, making them super grippy clippies, without the pulling! A center knot is the middle part of the bow. It can be ordered in two different styles. Either a flat knot or a rosette knot. The center knot is merely a personal preference. 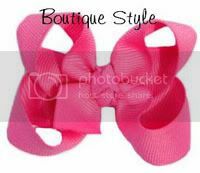 If no preference is given, the bow will be made using a rosette style knot. 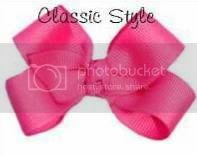 What are the Classic and Boutique bow styles? We offer 2 different bow folds. Each style is just a matter of personal preference. The Classic Fold is our original Bowtique bow. The fold is flatter with a simple, clean fold. The Boutique Fold is a fuller, fluffier fold. It almost looks like the bow is standing up. The choice is yours! What size headband should I get? 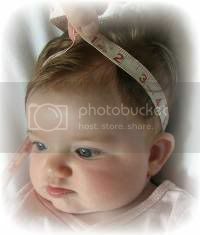 The easiest way to get the best fit for your baby is to measure around her head where you'd like the band to sit. All of our bands are soft and stretchy to give a couple inches for growing heads. The age recommendations are approximate guidelines. Your measurements will be most accurate. Remember, all of our items are hand crafted to fit your custom order. There may be slight variations from the product picture.